I loved Surely You're Joking, Mr. Feynman! : Adventures of a Curious Character. It was funny, insightful and a lot like listening to my Dad and his brothers talk about their lives. I connected with Richard Feynman in that book because he was so much like my father. They were both geniuses, they both forged their own paths, and they both know how to spin a good yarn. Before reading that book, I had no idea who Richard Feynman was. I'm not good at history and I don't know the first thing about science, but I love good stories, especially when they're funny. When I saw that this book was available for cheap on Audible, I grabbed it. It turns out it wasn't nearly as funny or coherent as "Surely". Mostly it fills in the gaps from the other book. There is the story about Feynman's first wife and her death (spoiler alert) at a young age, for instance. Not a lot of laughs there. The largest part of the book is the story of Feynman's participation in the presidential commission studying the Challenger space shuttle disaster. Again, I was reminded of my father. Like my dad, Feynman had no patience for rules or procedures. The lawyer in charge, whose name, Mr. Rogers, kept making me think of the children's TV host, tried hard to rein Feynman in and keep him on the politically correct path. Wasn't going to happen. I was particularly interested in the subject because I had to do a group project on the Morton company in college. We were supposed to figure out how to spin the story and chart a path for them to recover from the bad press. I thought I knew quite a bit about the incident but realized, after reading this, that I didn't know nearly as much as I thought I did. There are a few laughs in this book but it's not funny like "Surely." 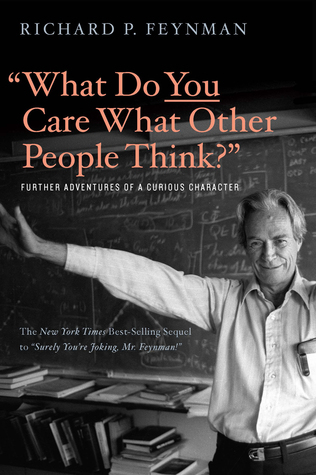 If you have to choose only one book by and about Richard Feynman, then read the other book. If you have time and space in your life for two of them, then sure, give this one a shot. It was interesting rather than entertaining, but it's worth a few hours.